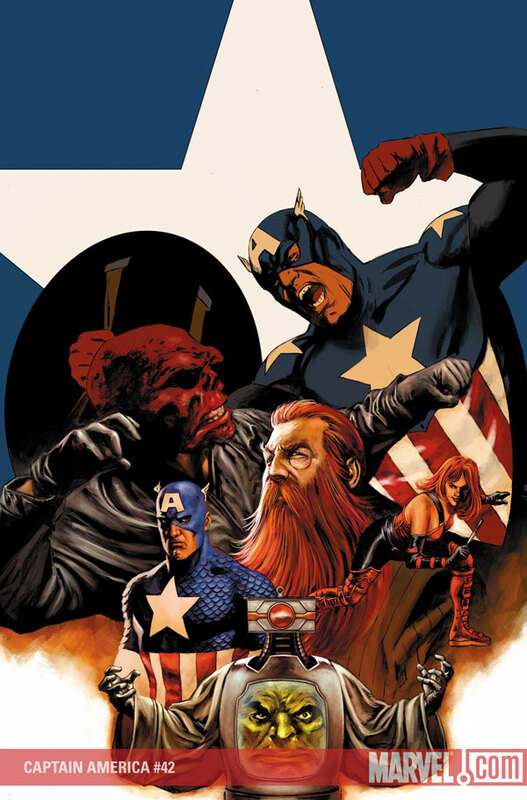 What follows is my review of Captain America #42 written by Ed Brubaker and pencilled by Steve Epting and Luke Ross which hits stores tomorrow but which we reviewed on the comicsbulletin.com website today. Originally there was an error in it (oops) but after Ed Brubaker himself pointed it out to me, I had my editor correct it. Just goes to show that these guys are reading our stuff!! Story: After manipulating Sharon Carter into killing Captain America, the Red Skull and his minions hold her captive while they planted their own presidential candidate to assault America from within its system. Meanwhile, our heroes race to thwart their plans and rescue Agent Carter. There’s another man claiming to be Captain America running around loose complicating matters. Analysis: Captain America, written by Ed Brubaker and penciled this issue by Steve Epting with Luke Ross, is truly Marvel’s blue chip comic. It never disappoints and always delivers with plenty of action, intrigue and good dialogue. Why should issue #42 be different? Brubaker wraps up the various plotlines from “The Man Who Bought America” story arc with the precision of a surgeon without sacrificing any of the above mentioned elements which make this such an enjoyable comic to read. From the fractured alliance of the Red Skull and the megalomaniacal psychiatrist Dr. Faustus, to the rescue attempt of Agent Sharon Stone who was pregnant with Steve Roger’s baby but captured by the Skull and his minions, to the explosive climax in which Bucky as the new Captain America attempts to thwart Sin’s plan, this comic is a marvel of modern storytelling and its pacing does nothing to detract from the way Brubaker crafts each individual character scene. On the contrary, the tension builds until it is ready to explode off the page, and this it does eventually into the superb panels depicted by Epting and Ross. It would take a lot of time to go into an intricate analysis of what makes their artistic style so good, but suffice it to say that the artwork is so consistently good on this title from month to month that it is almost not even worth noting. We have come to accept the fact that both the facial expressions of the characters and the explosive action sequences required for the narrative are always going to be expertly handled and they are. Natasha, S.H.I.E.L.D., the Falcon and the rest of the supporting cast give the comic a vast array of story telling possibilities, but this issue was all about delivering a tightly crafted and explosive conclusion, and it doesn’t fail to deliver that. One intriguing aspect was the inclusion of the Captain America from the 1950s, a character which got caught in the crossfire and truly believed he was the real Captain America. Brubaker’s use of this character shows that he isn’t afraid to use past Marvel continuity to help tell a good story, and he respects what other creators have done in the past. So rather than being burdened by continuity or ret conning, he builds on what’s come before with precision and great skill. I also enjoyed the fact that over the course of this story line the character of Red Skull’s daughter, Sin, was fleshed out. Brubaker takes his time developing his characters over the course of the arc, and it pays off by his delivering interesting well structured characters instead of the clichés and caricatures of villains running around in a lot of other comics. Final Word: This comic is moving in a new direction next month, and I cannot wait to see what Brubaker and company have in store for us as this past story arc was nothing short of brilliant. This entry was posted on Wednesday, September 24th, 2008 at 12:13 am and is filed under Uncategorized. You can follow any responses to this entry through the RSS 2.0 feed. You can leave a response, or trackback from your own site.